Dreaming up new planets is a favourite pastime of science fiction writers, but the universe often has them beat – coming with planets in place and forms that we had quite thought to imagine. Today we know of 228 planets orbiting alien stars, and in this episode we will look at the diversity of these worlds, from Mushy Lava covered planets to Icy Giants to the hottest of hot Jupiters. Dr. Pamela Gay: With me this week due to Fraser Cane’s illness, is Dr. Chris Lintott of Oxford Astrophysics. Thank you for rescuing us Chris and welcome to the show. Dr. Chris Lintott: That’s alright; we know anyone from the Commonwealth sounds the same to you. Dr. Lintott: Canadian, British, does it matter? Pamela: I can actually differentiate. My husband is after all Canadian and I have many Australian friends. I can even tell their accent. Dr. Lintott: Okay, well at least I can’t do an imitation of a Canadian [Laughter] so I’ll just be myself. Pamela: That sounds wonderful, welcome and thank you. Dr. Lintott: It’s been a good week for extrasolar planets. Pamela: Well that brings us to the topic of this week’s show. Dreaming up new planets is a favorite pastime of science fiction writers, but the Universe often has them beat coming up with planets and places and forms that we quite thought to imagine. In this episode we will look at the diversity of planets being discovered by astronomers from mushy lava-covered planets to icy giants to the hottest of hot Jupiters. Today we know of 228 planets orbiting alien stars. But no matter how many we find I think that we’ll always have a soft spot – and I know I have a soft spot – for that very first planet that was found. Can you tell us about that first alien planet? Dr. Lintott: Yes, I detest it. I don’t know where your soft spot is coming from [Laughter] because the first planets to be found made no sense at all. You talked about planets orbiting stars and I’m sure everyone immediately jumped to the sci-fi thing of I don’t know, nice red sunset on some alien world. Your alien of choice beside you as some distant sea laps on the shore. The first planets weren’t around normal stars at all but around pulsars, the remnants of dead massive stars. They shouldn’t be there. They were announced back in the early 1990s. Dr. Lintott: Sure and good memory. I was younger than you at the time. Pamela: I was a senior in high school. Dr. Lintott: Fair enough. The point was that the astronomers who detected them by looking at glitches in the radio signals that we get from the pulsars. The pulsars are normally very accurate clocks. If they’re pulled even a small way out of sync, you see a glitch in the signal. The first planet to be announced in this way by a team of Jodrell Bank up in Manchester and not in Canada and were [Laughter] just a mistake. They turned out to have forgotten to account for the fact that the Earth’s orbit wasn’t circular. It’s an ellipse that causes glitches in the data too. That made most of the pulsar planets go away except for one. So there is still one pulsar which has a planet around it. Now that makes no sense at all. A: we don’t like having one thing in the Universe. Why should there be something unique. Secondly, these are stars that exploded at the [Laughter] of their lives. How could a planet have survived around a star that explodes in a supernova? It’s a mystery. Pamela: The first pulsar planet and the only pulsar planet that we’ve kept so far was discovered with the Arecibo telescope. I remember it because I was told: “I’ll give you a beer, wait you’re too young,” by a very excited radio astronomer [Laughter] who wanted to celebrate this moment and had beer, but I was 18. Dr. Lintott: I talked about this planet with Dame Jocelyn Bell Burnell who is the discoverer of pulsars. It’s her least favorite object in the Universe. It’s the one thing that she wishes would go away because it doesn’t make sense. Pamela: That sounds like a good plan. So we went from this pulsar system to people trying to find ways to find planets around more normal systems, more nearby systems, and maybe find planets that we actually understood. Dr. Lintott: It’s a game people have been in since what, the early eighties, systematically searching for planets. Pamela: The way that we’ve been doing this has been using the Doppler system and the Doppler shift of the light. We can actually measure stars moving at about the rate a person walks, one meter per second. By looking for slight variations in the motions of stars (we did a whole show on this that we’ll link to in the show notes) we can find these planets tugging on stars and identifying, ooh planet and then start to figure out what are the characteristics of the planet, what mass does it have, what orbit size does it have based on the periodicity and 51 Peg was that first planet that we found. Dr. Lintott: Well, you made it sound very easy. It’s a simple idea; you’re looking for the wobble of the star. We can’t see the planets directly. They’re actually if you do the calculations it’s not that the planets are too faint to be seen, it’s just that they’re drowned out by the glare of the stars next to them. That’s the problem, picking out the tiny objects shining by reflected light next to the bright star. You made it sound easy, just look at how the star wobbles. [Laughter] But first of all, we should emphasize, we’re talking about meters per second. That’s an accuracy that’s unheard of in astronomy. It’s unheard of in physics really across these great distances. Secondly, the problem is that you need to understand what the star is doing because stars are complicated things. As I said before, they’re not the children’s drawing of a nice orange or yellow disk. Pamela: We’re not even looking at that disk. What we’re looking at is the spectral lines. These lines vary with temperature. They vary with rotation rate of the star. They vary with the mass of the star you get different line width. That doesn’t affect it but anything could be happening to change these lines. Dr. Lintott: You need to understand the stars. What we do is start by looking at boring stars. As time has gone on we’ve got better at that. Certainly the first star is 51 Peg is a perfectly ordinary, dull, unchanging sensible star. Much more calm than the sun for example. There were these Doppler shifts and you would deduce that they were planets from them and people went on and did many more of these, but there are a couple of flies in the ointment. One is for you to understand the star properly. And second is the reason that some people are skeptical is that this planet wasn’t what we thought we were looking for at all. It was what we call a false Jupiter. Pamela: We all started with this initial belief that we understood how solar systems form and they all form according to what I learned initially. Then they re-wrote everything when I was in graduate school that you have rocky worlds next to the star. You have gassy worlds out mid-part of the solar system. Then you stick the icy stuff – Neptune, Uranus and Pluto which was still a planet back then out as far from the sun as you can get in your solar systems. We suddenly got rid of the entire inner solar system and put basically Jupiter closer than Mercury is into the sun. Dr. Lintott: That’s hard to explain because we had a nice standard model for why you had rocky planets close in, hot stuff out to the sides. Specifically what happens is this: you form planets by banging together dust grains. Some of the dust grains stick; you build up bigger and bigger bits. If you’re in a region of the disk from which planets are forming where there’s lots of hydrogen, which means you’re in a colder denser region out towards the edge and you get past a critical size which is something like don’t hold me to this but something like the size of Mars. Then suddenly you can attract – so it must be bigger than Earth – forget Mars, it’s bigger than Earth, attract the hydrogen suddenly you get the gas giant. We still believe that even these hot Jupiters like the planet orbiting 51 Peg must have formed out in the outer disk. There’s no way to hold onto the hydrogen in the hot region of the inner disk. So, we have this bizarre crazy model of the early solar systems around these stars where something like Jupiter forms and then instead of staying put where Jupiter is, we think these planets must have migrated inwards towards the center. It turns out there’s a pretty good reason why they might do that. It’s just that no one thought to consider it because we’ve never needed to. We don’t have to do this to explain our solar system. Dr. Lintott: It’s just friction. Pamela: It’s friction. You slow it down by rubbing it up against stuff in smaller orbits basically. It eats that smaller stuff as it spirals in and it eats that smaller stuff as it spirals in. You can get them to stop by having them hit a point where there is nothing slowing them down, where that area has been cleared out by the central star. Dr. Lintott: So if the star has been active and cleared the inner part of the disk then your planet stops there. That’s the hot Jupiters. The question is why doesn’t that happen in our solar system? Why is Jupiter still sitting where it is? Pamela: The other question is why are there solar systems that only cleared out something a fraction the size of Mercury’s orbit and nothing else and ended up with Jupiters basically on top of suns? We’re left with this diversity of questions. Dr. Lintott: I think diversity is the key word there. We’re now arguing about things that there isn’t a correct answer to yet. Diversity is the key word because we know there’s a diversity of stars. Anyone who has looked at young stars knows they’re as individual as teenagers. Some are violent, some are dramatic, and some are calm and quiet and sitting and getting on with their lives. It’s not too surprising to me that you’d have different size gaps. What is amazing if you look at the simulations and I think it is stunning is that this may have happened several times in the same solar system. You don’t have to explain a hot Jupiter that may be just the last one in. Our solar system may have had several of these things rampage through the area [Laughter] of the solar system that we now sit. Pamela: And we don’t have any facts to base that but theorists can come up with it. Dr. Lintott: I said may, but the point is the hard problem is now not explaining hot Jupiters. The theory of planet formations has undergone such a transformation in the last ten years that the problem isn’t explaining 51 Peg b and so on. It’s explaining Jupiter. Pamela: Yeah, so now we’re in this situation where we’ve thrown up our hands. We’re looking everywhere for planets. We’re looking all the places that we never thought to look. We’re looking around little tiny red dwarf stars, giant hotter stars, stars that are tens of times larger than our sun and we’re finding planets just about everywhere we look. Dr. Lintott: We’re looking to the center of the galaxy where there is that interactions between stars would be too frequent to find planets. We see planets there. We look around binary stars. Everyone knows that despite the sci-fi – everyone knew I should say – that you can’t have a stable orbit for a planet around a binary star. It’s just too complicated and yet there they are. Pamela: It’s Bill Cochran at the University of Texas who made that first discovery with 61 SIG and since then we’ve continued to find them. My favorite exoplanet is Tau Boo c. Try saying that one fast. It’s a binary system where ‘Tau Boo a’ is the star, ‘Tau Boo b’ is the second star and ‘Tau Boo c’ is the planet in the system. So, we’re finding them in binary systems, in all sizes of stars and what’s cool is we’re also now starting to finally find all sizes of planets as well. Dr. Lintott: Because this is what everyone wants. Nevermind hot Jupiters, they’re very exciting, nevermind normal Jupiters which we’ve begun to find out. Techniques are now such to allow us to see Jupiter things in Jupiter-like orbits. It takes awhile; you have to wait for the Jupiter to orbit its star so you have to be more patient. But there you go. All we actually want is Earth’s. We like gas giants; I have good friends that study gas giants. Cassini is an amazing spacecraft [Laughter] at Saturn but what we care about is we want to find Earth’s and we want to know if there is liquid water there. We want to find things that we could go to or that aliens might be on. That’s what this is all about. Where do we get to next? I guess the record for smallest extrasolar planet keeps being beaten. After the hot Jupiters and the Jupiters, I think the first thing what press releases called super rats which is a bit desperate, I’m not sure that’s going to survive. What we really look for are things five to ten times the size of the Earth, ice giants, at least to me. Pamela: Right and one of the frustrating things as someone who does receive press releases is press officers love to use the phrase ‘Earth-like’ when they’re talking about Neptune. I don’t know about you but the only thing Neptune and Earth have in common is they’re predominantly blue. The reasons they are predominantly blue are very, very different. You..
Dr. Lintott: It’s not water in that case. Pamela: No, you don’t really have to worry about the white sharks if you go into the blue stuff on Neptune. You do have to worry about methane, ah, slightly different. Dr. Lintott: But Neptune is cool. I mean this is we should start a campaign to preserve Neptunes in the Universe. I think [Laughter] it’s not a superrat. It’s an unusual class of planet. That’s another way everything we learned – you and I – in school is wrong Pamela is that you said there were two types of planets. Now actually you were better than that, you pointed out that everyone learns there are two. You have Mercury, Venus, Earth and Mars which are rocky; Jupiter, Saturn, Uranus and Neptune which are gas-giants. Well it’s not true. Jupiter and Saturn have a very different internal structure to Uranus and Neptune. Jupiter and Saturn fit the traditional picture of failed stars, big balls of hydrogen that basically didn’t get big enough to ignite. Uranus and Neptune are more complicated. They seem to have a that delineated – I guess that’s the word – internal structure that the composition is very different and things in the outer solar system where they were forming were chaotic. It’s possible for example that they swapped places as many as 10 or 20 times. They’re interesting worlds in their own right. Pamela: So we have these icy, ammonia, methane molecule-rich planets that have these interesting changing weather patterns where we see storms and what’s cool is as we look out at other stars we’re finding more and more examples of these. What’s neat is as our technology improves, as we look at more and more cases (in some cases just looking at smaller stars) we’re able to start finding smaller and smaller planets. This is because the Doppler-shift, you get the biggest yank from the biggest world. 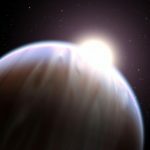 The hot Jupiters that are really close in can do the most damage to their star. In some cases actually causing tides to move across the surfaces of stars when they’re close enough in. That’s one of the things that I think is really cool. Dr. Lintott: Have they been seen there? I haven’t seen result. That’s fantastic. Pamela: We’re actually able to determine that the surfaces of the stars are getting affected by these nearby planets. At the same time we’re also getting these dramatic weather effects where in some cases with these hot worlds that are shooting really close into their stars. There is one case of a planet, not romantically named, it’s HD80606B. It’s a gas..
Dr. Lintott: I love the names, don’t you? Pamela: [Laughter] These names are actually quite ridiculous to try and work with. HD means it is from quite particularly from I think the Henry Draper catalogue. Dr. Lintott: I think the point is no one cares, right? It’s a planet that will do. Pamela: It’s a planet. This particular little planet about 190 light years away from the Earth and is quite gas-giant – think Jupiter. It swings in from an orbit smaller than the orbit of Mercury so it gets closer to the sun than Mercury is. Then it comes back out on an elliptical orbit to more like the Earth’s distance away from our sun. In one six-hour period while we looked at it with the Spitzer space telescope, this planet’s temperature rose from 980 degrees Fahrenheit to 2240 degrees Fahrenheit. We’re seeing weather and storms on planets around other stars as they get deeply affected by their orbits by their star. Dr. Lintott: It’s the orbits that are keys. I’m going to keep coming back to the quest everyone really wants an Earth-like planet. Yes, that means smaller rocky but it also means a place where water can survive on the surface. That means that it needs to sit in what some people including myself like to call the Goldilocks zone. So if you remember the story of Goldilocks and the 3 bears, the point was you want the porridge that isn’t too hot, isn’t too cold but is just right. So just like back in the solar system, the Goldilocks zone is the place that isn’t too hot to have water like Mercury and Venus, isn’t too cold to have liquid water like Jupiter, Saturn and so on but is just right. Like the Earth, Mars is just on the edge. We can predict the Goldilocks zone for any star we look at. What we really want is to find planets orbiting within it. We haven’t found any Earth-sized planets in that little zone so far. What we have found it had plenty of gas drives and ice drives that sit back. I need to mention that because they may have moons, we’re not there yet. Dr. Lintott: If it pleases you. Future space station – but why not let’s have civilizations on moons. The reason why I want to talk about exoplanets today – I think we both did – was one discovery came from a French group just a few days ago. Pamela: And it was found with a completely different technique than what we’ve mostly been talking about today. COROT instead of looking for the rate at which stars move, looking at the Doppler-shift, it actually looks to see the light of the star get fainter because the planet is passing between us and the star, eclipsing a small amount of the star’s light. We call this a transit. This is something anyone with a 4-inch telescope that’s really well set up can do. There’s information at transitsearch.org on how to get involved in doing this. Dr. Lintott: The COROT is slightly more advanced. It’s not a bigger telescope than the one many of you will probably have. It’s a 27 centimeter telescope so that’s what 9 and a bit inches, I think? But it’s in Space which does give it an advantage. It stares at a large number of stars and looks for these transits. It found one, a particularly special one which we’ve just been told about. The planet is called COROT-Exo-7b. You know it is bad when even the French can’t think of a romantic name for [Laughter] a new world. COROT-Exo-7b is a star less than twice the diameter of the Earth. With the transits you don’t just measure the mass, what you get is a size because you see the planet begin to move across the star and then you see it move fully onto the disk so you can actually measure the size of these things which is stunning. Pamela: And the way this works is when the planet is fully in front of the star you’re at a flat point in the minimum of the light. So you have a sloping part as it goes from the normal amount of light that you see from the star, slopes down as planet starts to block, it starts to block….planet fully in front of star. Then you get a flat point. It’s that flat point that is while it moves across the disk and then you get this slowly coming back out from in front of the star. This gives you the diameter. Dr. Lintott: So we have the diameter, which is fantastic and the point is it is below the crucial value. People will argue about where you move from a rocky planet to an icy giant but we’re talking somewhere around 5 times the mass of the Earth. Pamela: Except you can’t exactly walk on its surface. It’s much more the consistency of really hot Silly Putty. Dr. Lintott: Because the catch is that it orbits its star every 20 hours. So it is very, very close and that means its temperature is probably between a thousand or one and a half thousand degrees Centigrade. Dr. Lintott: Well, it is warm. It’s certainly not in the Goldilocks zone. You wouldn’t eat porridge that temperature. Actually it is interesting. I haven’t talked to any of the experts yet. It’s something I need to do. Is this rock that’s just very hot? Is that hot enough to melt? I mean the Earth’s surface does pretty interesting things at that velocity. Maybe it doesn’t have a crust at all. It’s possible that the planet has some sort of strange lavary, magmary mix. It’s intriguing but it is the first terrestrial planet. It’s like an extreme version of our Mercury and that’s an amazing moment in human history. Pamela: Just for some perspective the melting point of iron is 1,535 degrees so we’re talking you can smelt without doing much effort on the surface of this world. Dr. Lintott: Okay, well if you and anyone want to do any smelting COROT-Exo-7b is the place [Laughter] to go by the sound of things. Pamela: So we’ve gone from knowing about super Jupiters that were right on the practically the surface of the stars they orbited to slowly finding Jupiters that are in more Jupiter-like positions that are more Jupiter in size. Some of the things we’ve been finding are way bigger than even Jupiter. We’ve started finding things that are Neptune-sized and these are cool but finally we have found something rocky. The next big thing that we want to find is of course another Earth. You can start to get there with COROT. COROT is still very sensitive to it needs to be close to the star to increase the probability of seeing it. Dr. Lintott: Think about if any of you listeners saw the transit of Venus a few years ago. You didn’t note when Venus moved in front of the sun as seen from Earth. You didn’t notice a significant drop in the sun’s temperature or brightness. You need the planet to be close to block out a significant amount of the star. Pamela: Beyond just that the probability of the planet lining up such that from the planet Earth we see it pass in front of the star, that probability goes up the closer and closer you get to the star. You can sort of imagine if you’re trying to line up a friend so that they are standing such that a statue on a distant hill appears to be on top of their head. Where they stand increases the ability of how easy this is to do. Get the planet right up close to the star and there are lots of places you can put it where you’ll see it in front of the star. Move it really far away from the star and the probability it is going to pass directly in front of the star is much more limited. Dr. Lintott: What we need is bigger telescopes to do this and more of them. That’s where a new NASA mission comes in that is due to launch next month. Pamela: This is the Kepler Mission. This one is going to be a lot of fun. This is a bigger telescope. It’s a 1.4 meter primary mirror. It’s something that we can start to look a little bit further out and we can start to be sensitive to smaller stars as well with the really high accuracies that are needed. This is a system that’s not going to orbit the planet Earth. If you’re orbiting the planet Earth, the Earth gets in the way of some of the parts of the sky that you’re seeing. Dr. Lintott: It’s a well known fact that the Earth gets in the way. It’s only light pollution. Pamela: Well yeah, the Earth is a problem. You’re right the light pollution from Earth is also a problem. You can get weird scattering effects that actually affect the photometry. To find that little tiny, in some cases thousandth of a percent drop in light when the planet passes in front of the star, you have to remove all sources of air. The Earth is a source of air so we’re going to get rid of it. The way we’re getting rid of it is we’re moving the satellite so it trails behind the planet Earth in orbit around the sun. It’s just going to sit there and look over and over and over again at a field in the constellation Cygnus. It’s going to be looking for the stars in this field to undergo these slight variations in light that indicate that a planet has passed in front of a star. Dr. Lintott: It is a very different search technique from what’s been used before. Other missions like COROT have scanned across the sky and taken data wherever they can. Kepler is targeted. It’s in this region and that’s where we’re looking. It is smack in the middle of the Milky Way to increase the number of stars that we’re going to see. You’ll not only be able to point to the star, look up at a star in the sky and say not only does that have planets, not only are those planets rocky, but we know they might have water, we know there may be light there. One day perhaps humans will walk there. It’s a stunning thought. Pamela: We already know how to look for different ingredients in the atmospheres of stars and in the atmospheres of planets conveniently enough. The way that we do this is to go back to stellar spectroscopy. Pamela: Exactly and the way we do this – we’ve actually practiced this in our own solar system – when sunlight passes through the atmosphere of a planet, that sunlight can have bits of color. Specific wavelengths that are fingerprints of specific atoms removed from the sunlight passing through the atmosphere. We look for that absorption and we look in some cases for different molecules, different atoms to also get excited and give off emission lights. These fingerprints of lines tell us what’s in the atmospheres of these planets. This is how we’ve studied the atmosphere. This is how we studied the atmosphere of Mars. It’s also how we’ve started to study the atmosphere of in some cases these hot Jupiters. We’ve even found water. Dr. Lintott: As you were talking about using that to study the solar system, yes Mars and Venus, they’re quite fun and interesting. My favorite story is that astronomers have even used this to try and detect life on Earth. So, the question is, what would we have to see in the Earth’s atmosphere to establish that there was life down here? It turns out, it is quite easy. For example the amount of oxygen in the atmosphere is way out of equilibrium. There is much more than there should be simply because that we have plants on the surface. So, if you were at a distant star and you’d detected the Earth, maybe with something like Kepler looking at our patch of sky, you look to the Earth’s atmosphere with the next generation and the equivalent of the next generation of telescopes. You need probably a 15 meter or something to do this properly. Pamela: stuff, carbon-dioxide being part of it, but there are other ways to get that. We’re trying to figure out what molecules come out and occupy atmospheres only when you have some sort of industrial complex at work destroying the atmosphere in a very civilization-specific kind of way. Dr. Lintott: You can take other steps too and before you get there. For example there’s a beautiful piece of work came out about a year ago where people looked at Earthshine, reflected light off the dark side of the moon. What you see if you see a crescent moon with the rest of the moon faintly glowing, that’s reflected light from Earth. If we detect that light with a large telescope that’s light seen looking at the Earth’s atmosphere and you can look at all sorts of features. There’s a favorite one called the red edge, it’s a sudden drop off in brightness which is due to the presence of substantial vegetation on the surface. It’s almost as if this decade we’re discovering planets. Then in the next decade also, we’ll be looking to try and make them worlds to give them personality. To look at what’s on that surface to see where there might be life. Who knows, it’s going to be quite a ride I do believe. Pamela: It’s already been quite a ride. We never quite knew where we were coming from in terms of well we had this model and it was broken and we were sad. Dr. Lintott: Need better names though before the science fiction writers make them up. Pamela: [Laughter] we do need better names. With the next generation of telescopes we’re going to be finding the great new discoveries of tomorrow which will hopefully include plants. Let’s just hold it at plants for now. The rest is the topic for another show. As much as I’ve loved having you here Chris, I have to hope that Fraser, poor Fraser gets his voice and his body back. Dr. Lintott: Get well soon Fraser. Pamela: Thank you and it’s been a pleasure Chris. You did very well indeed and I love your choise of guest, he’s very dry and funny, you two made a great combination. Wish Fraiser the best please and GET WELL SOON! Thank’s for hanging in there, I was checking this website every day – when’s the next episode – when’s the next episode – Ah ha. Fascinating episode–it paired well with a thread I was just reading on the BAUT forums about pulsar planets. No-one noticing the huge typo in the above description? 228 binary star systems eh? May I say how pleased I am to hear your voices again! Don’t want to sound like a crazy fan, but I’m really glad that our incredibly informative and superbly educational podcast is still going “Not only tell you what we know but how we know what we know”. All of the other podcasts I’ve come across and listen to, which I like too, only tell you what we know. Not like Astronomycast, they’re more of a news bulletin sort of thing. Who else would give us a weekly Q&A show in addition to a regular show?! Guys, your love to science and education is amazing, and we share you this passion! Thank you! Chris is always a very good choice. Fraser, I hope you get well soon. Yet another brilliant show. Thanks. And get well soon Fraser. More, MORE! Muaha ha ha ha haaa! This was a great episode! Planets are my favorite topics in astronomy. Incidentally, I have recently been daydreaming about what life would be like in a planet around a red dwarf in the habitable zone, considering that one side of the planet would be gravitationally locked to the star. For example, most of the planet would be unliveable because the center of the side facing the star would be too hot, too cold for the other side, so most life would have to adapt in the twilight zone, and there would be big winds going from one side to the other, etc. Those are interesting things to think about.